Leonard Bishop | "Is There Anything To Be But A Writer?" We hope you enjoy this repost by one of our favorite men and fathers, Leonard Bishop. Happy Father’s Day! It was a good day in both our lives. A day separated from the world of calamity and fright–from decisions and moralities. There was only Luke and me–a nine-year-old boy and his dad–fishing. My son has become an eager fisherman. The only time he speaks to me these days is to ask, “Dad, take me fishing, please, please.” What I know about fishing you can hang from a gnat’s belly button and it would still not be weighted down. But fatherhood demands that I become my son’s role-model. That he patterned his growing-up-years after the masculine qualities in my character. My RUSH to adventure! There is a large pond on a neighbor’s property. He has it stocked with all sorts of fish. Crawdads, bluegills, catfish, and other brand names that Luke has suddenly learned about. The neighbor agreed to let us fish there. We bought some hooks and line, some worms and red plastic balls that float (he calls them bobbers). I skinned a tree branch for a pole, and we went fishing. Tom Sawyer and Huck Finn. I sat on the grass, watching him lean the pole into the water. I can feel chiggers slowly burrowing into my skin. Squadrons of mosquitoes from the air, ready to target me. Luke, forgetting his vow of silence while his hook is in the water, calls to me, “Dad, how about you being in the one who cuts off the heads, okay?” I nod, “Sure,” though I am suddenly nauseous. I don’t want to touch those greasy looking slabs that gape at you with one eye. I stare at his slender body, the gracefully slouched stance, how he licks his lips, the way of he grips the pole, and I am the total sensation of love. There he is, my son. Experiencing the right now of his life. He doesn’t want to become the president or crave to own a Porsche. There are no famines, no earthquakes, no world beyond the pond. He and his pole and the water are one. He just wants to catch fish. What does he think about as he waits for a fish to take his bait. He is not thinking about ideas. He is inventing legends and imagining heroics. Hidden in the pond is a monstrous fish that has already swallowed 11 little boys. But the fearsome creature has never done battle with Luke Bishop–majestic in dream, magnificent in deed. He would hook the pond’s monster and hundreds of people would rush to witness the monumental struggle. Using every muscle in his small body, he would grapple the gilled villain into exhaustion, then beach the beast. Newspaper people from as far as Marian and Hope would photograph him standing on the scaly titanic. Then he would suddenly stomp the gargantuan fish’s belly. The canyon huge mouth would open and 11 scared boys and a cute red-headed girl people had forgotten about, would rush out, charging to their joyous mothers. Cheers would rock the skies. And for his conquest of the Cyclopsian pond fish, he would be presented with an official boy scout knife initialed L. E. B. Not all of fishing is delight and satin. He crimps his mouth and squirms with horror when I say, “Here’s a worm. Chop it in half and put it onto the hook.” He draws away and says, “you do the worming, Dad. I’ll do the fishing.” The long slippery thing slithers and oozes and the barb stabs my fingers. But I play macho and finally hand him his line. He rushes back, using his pole like a baseball bat, and casts. I don’t want to enjoy fishing. It is a blatant waste of time. So many stories could be written in that time. I would rather balance my checkbook or have an old tooth drilled. But this is a pastoral interlude, a loving time between Luke and me. It is man and boy time. It is friendshipping and being just guys. It is maleness time. But sometimes, while I watch him fish, I feel dry with sorrow. I see him growing up and his voice roughening, and he is intensely into sports and having fantasies about girls, and he has no time for a bumbling man who wants to sit and reminisce, “Hey, Luke, remember those summers we went fishing?” The days will change him, tyrannized in him, filling him. He is all pulse beats and electricity. I am twilight. I need eyeglasses to clearly see his face, and my thoughts fade. Age softly talcum’s the mind and there is no great length of years ahead, so you ease into the dwellings of yestertimes. In the shadowy corridors of memory you call to your son, “Yo–hey, Luke, don’t forget your dad.” and your voice echoes and roles and slowly hushes while you watch yourself and your boy as you were then–and he’s in some other time in another place, becoming his manhood. So you’ve got to love him now–every second. And while you are letting him go you must hold on to him. As long as you can–even if you have to join with him in fishing. He dared us to write well! 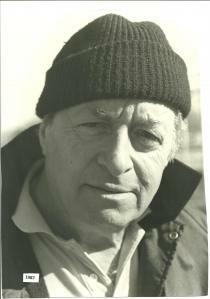 Anyone who uses the phrase, “indomitable” must have met my writing mentor, the late Leonard Bishop. He grew up in conditions of poverty and violence that would destroy most of us. He believed, despite all the contrary evidence the world kept shoving at him, that he was someone special. He knew that deep inside him, there was talent. He just needed to find the way to let it breathe. For a while, he thought he might be a sculptor and needed to protect his hands. This kept him out of brutal street fights. Good thing, too. He was massive, strong, a likely target for boys who needed to prove themselves by besting the big kid. He trained as a draftsman and worked a thousand odd jobs before he found his writing voice. He knew he had something to say and the world had to listen. If you spend five minutes watching students in a middle school hallway, you will be bombarded by personalities. There are kids who sparkle with life and energy. They are often loud, with long steps, large smiles, and a gaggle of followers who wish they could trade places. Catch that person’s attention, say, “Good Morning,” and smile. You’ll get a big, “Howdy” or “What’s up?” Others are shy, but smile back and wave a few fingers under their binders. I’m sure Leonard would have been one of the loud ones. I imagine him outside shouting into the wind, “Listen to Me!” If kids like him are lucky, someone will and may be touched by what they say. But others are the ones I worry about. The ones whose spirits are already weary. They are the stragglers who believe they are invisible. Losers. They walk head down and shuffle by the lockers, so close they bump their shoulders on the padlocks. The locks clang loudly and the children jerk, as if the sounds are wolves in mid-pounce. When the Invisible do speak, their words often mask all passion. They are quiet. Monosyllabic. Forgettable. What a waste. And it’s too likely they will live out their whole lives that way. Apathy is a great camouflage for pain. 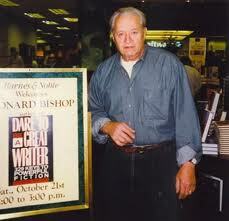 Leonard Bishop used to come to my classroom and talk about writing. A big, energetic, dynamo, he made the children laugh at first. They liked him and crowded around, seeking his autograph. Then, like a magician pulling scarves out of a hat, he made them talk about themselves, their dreams, their imaginations…or their fears. Then, he made them write. After a few hours, he’d know the names of my Invisibles. He’d call them up to sit beside him and relentlessly encouraged them until they had said something profound. I’ll never forget one eighth grade boy, over twenty years ago, who was so afraid of misspelling words that he’d write only what he was sure he could do perfectly. I remember he wrote, “The brown cow ran.” After two days in my classroom, Leonard coaxed out of him, “I laied (sic) under my cardboard box on the wet New York sidewalk.” Leonard pounded him on the shoulder, “That is Real Drama!” I remember the rest of my students and myself staring at the boy we had never seen before. He was transformed into someone who had something to say and could now make the world listen. Leonard was an artist after all. A sculptor of human beings. Thank you, Leonard. A Beautiful Reminder of Christmas! Thank you, Leonard! My son, Luke, asked me, “Dad, is there a Santa Claus?” I sat fixed in a painful decision. Five-year-old children must have a sense of fantasy and fable. But when a well-intended lie sneaks into love, the lie remains and the love is changed. The heart carries a soiled shadow. Children must soon learn the truth and the truth is not always cruel. When I am in my studio, I am compassed about with four walls solidly shelved with books. Tacked onto the shelves are particular quotations by people whose insight and wisdom have touched me deeply. When I’m researching a subject, I’ll read some quotations and pause what I am doing and stare at the quotation and think about what it means to me. Some mornings I’ll leave the bedroom and the day becomes like leather balloons popping me into despair. Someone will complain of cramps and he’ll stay home and my worrying about him will disrupt my work. The plumbing will start to back up, and electrical connection will begin smoking, the mailman will shuffle past the house and not leave the royalty check I expected. I’ll take my load of vitamins, then forget I’ve taken my vitamins and take them again and I’ll feel bloated, or hyper, or faint. The can won’t work. I have to chase the dog to stop her from chewing off the cat’s leg. I am unable to think of a plot line. The inside of my head sounds like a truck without a muffler. My hearing aid batteries die. This goes on all day and when the day is over. I moan,”Hallelujah,” and finally, back to bed. That quotation makes me sigh with sadness for other people. My home is large and sprawling and the inside of it is peaceful, loving. We are always talking with each other. There is laughter. Whatever we do, someone is always interested in what we are doing. If Luke is home, I listen to him play his guitar. Celia will be reading something I have written and her gentle smile makes me feel it was worth writing. We have food, and as someone sets the table, some one else is looking for the napkins. We have clothes to wear and good friends to telephone or come over and visit with us. Someone will put on the television, then shut it off because we do not have cable or whatever other service people usually have. We watch carefully selected videos. There is no tension, no irritating distractions. Celia lies on the long couch, blanket across her legs, potato chips and hot tea on the coffee table. Luke is practicing his guitar chords. When our daughter, Kiersten, is home from Kansas City, she sits on the floor, leaned against the piano leg reading a thick law book as she researches for information on how to develop a case for her law firm. I’m laying on the other couch, legs curved over the thick arm, pretending to read a soul-shaking book on philosophy and hoping I don’t snore. So, tomorrow will probably be different but it will never be better than today. Critics are self-declared judges whose standards for approval or rejection are based on their eccentric dispositions. They specialize in being meaningful at the sacrifice of the work. They usually do not understand or have not completely read. Never, in the literary history of civilization, has a critic provided anyone with the perception worthy of recalling. Critics comprise a profession for which there is no social use. No one ever raised an altar or created a monument honoring a critic. There is no ordained school for learning how to become a critic. There is no examination issued by an educational body to determine if anyone is qualified to become a critic. Usually there is a void in some publication caused by the arrest of a quirky editorial writer. To curb a crisis of having nothing to print, a filler is dropped into the space, written by some critic. Then, because you fill the void three times, you are declared to be a critic. Yes. Critics are void fillers. Their product is little more than diluted bovine excrement. Celia calls me a writer whose greatest skill is in arranging discord into planned chaos. She does not understand that my desk is not repository for clutter. I can always remember some of what is on my desk and the reason why, months ago, I piled it there. The box of staples is there for the time I decide to buy a stapler. The seven stiff and dried teabags are being used to stop the ball point pen refills from rolling over the used coffee filters. I can’t throw away the scraps of paper on which I have written telephone numbers until I find out whose phone numbers they are. And the eyeglass case is there for the time I find my spare eyeglasses. Celia is wrong to say that what is on a man’s desk reflects what is in his head. When someone is a dedicated writer. His greatest difficulty is in trying to appear like an average undisturbing human being. Most people make themselves become what other people expect them to be. The writer is forced to be with real people when he would rather create his own. People demand that he be odd and unique and interesting. When, in his depths, he is a bland, remote, and droningly repetitious. So while he tries to become what he really is–average, mundane, redundant-redundant-he is forced to behave in an odd, noticeable manner so that he can be thought of as different. As a social person, I am boisterous, bizarre, often irritating, a sloppy dresser, a blunt opinionizer, somewhat sarcastic, pretentious about being wise and talented in counseling, and a proclaimer of rules of behavior, no one can fulfill–not even the proclaimer. But within myself, wherein is the real person, I am easily confused, hypersensitive to being disliked and will make great sacrifices for the approval of people for whom I have no respect. I am even timid, reluctant to commit myself to a positive opinion because I haven’t the character to back it up. Only when I am writing am I bold, enigmatic, and forthright. I became a writer, partially because I wanted to expose my soul and reveal what I really am like– rather than let what people believe I am like, become what I am. “To thine own self be true.” (Willie-the-Shake). That is a quote I never understood, though I often use it. How can you be true to yourself when you do not know who yourSelf is? Tis a puzzlement.